On Friday, U.S. Senator Rand Paul, a Republican from Kentucky who was one of the many candidates who sought the Republican presidential nomination last year, was assaulted by his next-door neighbor. According to reports, Paul, who lives in a gated community near Bowling Green, Kentucky, had just stepped off his riding lawn mower when Rene Boucher, a retired anesthesiologist, tackled Paul, who was wearing ear guards and didn’t hear Boucher coming. The assault was so violent that it broke five of Paul’s ribs, bruised his lungs, and left him with cuts on his face. It’s not clear when Paul will be able to return to his job in the Senate. Boucher has been charged with misdemeanor assault, and could be charged with a felony given Paul’s injuries. Putting aside my revulsion at an unfair sneak attack and physical assault — regardless of our political views, I think we can all agree that tackling somebody from behind and breaking their ribs is not appropriate and must be punished — I at first was intrigued by the news that Paul mows his lawn himself. I’m not in agreement with many of Paul’s positions on the issues, but it’s nice to know that there is still a Senator out there who still willingly experiences some of the basics of life, like cutting the grass. Sometimes you wonder whether our members of Congress, rich, staffed to the gills, and surrounded by people sucking up to them at all times, have any concept of what it is like to live a normal life in America. Cutting your own grass is a good start, so I applaud Senator Paul for that. But the story of this dispute between neighbors seems to now be going deeper. What would motivate a retired anesthesiologist, who has lived next to Paul for 17 years and once worked in the same hospital with him, to tackle a United States Senator? Boucher’s lawyer said politics had nothing to do with it, and described the circumstances as a “very regrettable dispute between two neighbors over a matter that most people would regard as trivial.” Some people in the area say that Senator Paul — who not only cuts his own grass, but also composts and grows pumpkins on his property — doesn’t pay much attention to property regulations in the area and has different views on property rights than his neighbors. The story linked above cites some anonymous sources as saying that the dispute finally escalated into violence because of things like “stray yard clippings, newly planted saplings and unraked leaves.” Could something minor like blowing yard debris really have been the straw that broke the camel’s back, propelling one neighbor in a fancy community to assault another? It just goes to show you that, when it comes to neighbors, the baseline requirements are pretty low. Living next door to somebody who won’t become enraged and assault you over a leaves, grass, and a compost pile is one of them. Recently, signs like this one have been cropping up around German Village. In these troubled times, they express a worthy and noble sentiment that I wholeheartedly endorse. Yet I feel that the message is somehow . . . incomplete. I’m perfectly happy to live next door to anybody, no matter where they are from, what they look like, where they work, their religion, national origin, or sexual orientation, or for that matter what they do with their lives. If they’re willing to live next to the likes of me, I’m willing to live next to them. My focus, instead, is much more narrow and admittedly self-interested. I only want to know whether they will perform very basic property maintenance — mow the grass, weed from time to time, not put a crappy couch on the front porch, slap some paint where it’s needed — keep their dogs from barking and biting, and not be obnoxious, intrusive, or noisy at 3 a.m. when I’m trying to sleep..In my view, these are the acid tests of neighborliness — the straightforward, but crucial, measuring points on the good neighbor scale of behavior. 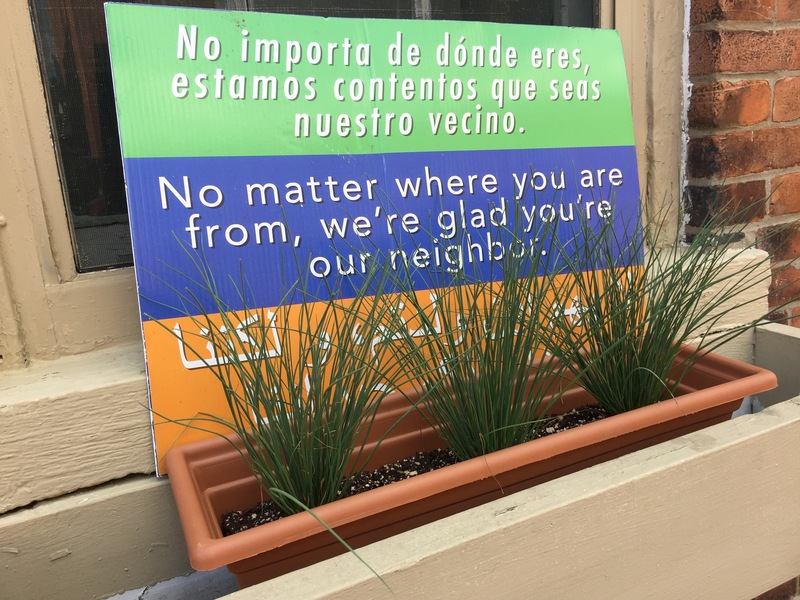 So I think I would amend the sign as follows: No matter where you are from, so long as you keep your place up and keep the noise down we’re glad you’re our neighbors. OK, that’s a bit of an overstatement — but only a bit. Few things are more irritating than arriving home from a hard day’s work and seeing salesmen prowling the neighborhood, ready to disturb your solitude and send your dogs into a barking frenzy. Tonight the salesmen were from AT&T U-verse. Before I could shut the garage door one of them had scampered up to my driveway and was shouting, “Hello! Is this where I can get my dinner?” Huh? What the heck does that mean? But rather than have the guy ring the doorbell and catapult Penny and Kasey into a nerve-jangling barkathon, I said hello and asked what he wanted. When he said he was from AT&T, I said we were on Verizon and didn’t want to change. When he said he wasn’t trying to sell cellphone service, I said we had no land-line phone. When he said he just wanted to tell me about AT&T U-verse’s upgraded, bundled cable/internet/phone service, I said I wasn’t interested. Of course, no salesman ever takes no for an answer. The guy kept asking me questions about our current provider and acting like all of our neighbors had switched over to AT&T U-verse and we were idiots for not letting him waste 15 minutes of our time with his sales pitch. Much as I respect and admire our neighbors — thanks again for the beer last night, Dave and Amy! — we’re not going to make cable and internet decisions based on what they have done. 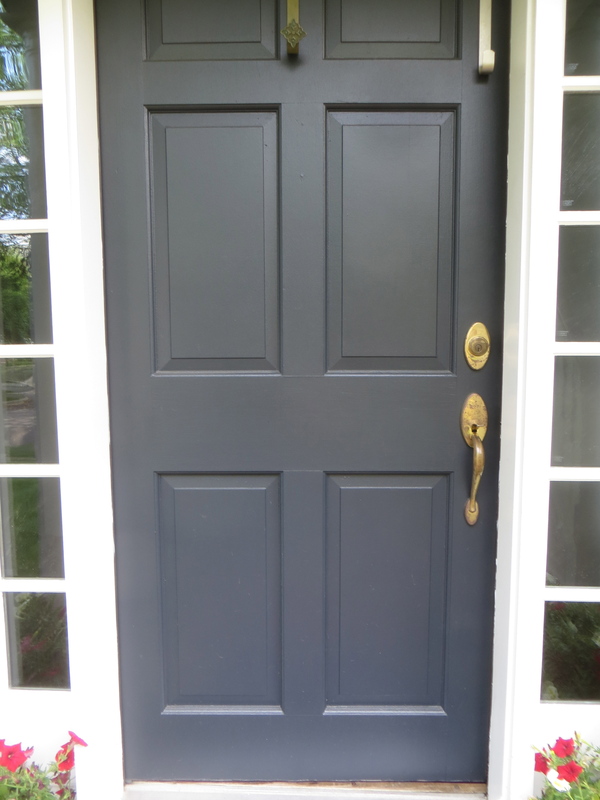 I kept saying no, not interested, and he kept pitching — so finally I had to be conclusive, say “no” with more vehemence, and shut the garage door in his face. I was trying to be polite, but he wouldn’t let me. Guess what? AT&T U-verse has come through our neighborhood before. And, they had already stopped at our house today, when Kish told them we aren’t interested. The fact that they troubled us, twice, after we told them we were not interested is unforgivable. Hey, AT&T — stick it! I will NEVER buy your service now. Stop bothering us! When you buy your first home and move in, your quickly realize that neighbors are an important part of the home-purchase equation that, perhaps, you hadn’t thought about when you were deciding whether to buy. The reality is, neighbors can mean the difference between a pleasant home-owning experience and one that is an unending nightmare. There are certain baseline requirements of good neighbors. Do they keep their property up? Do they keep a beat-up sofa on the front porch? Do they play loud music until 3 a.m.? Do they have a vicious dog that scares the crap out of you every time you walk out the front door? Flying a KKK flag and displaying a noose and a sign saying “Members Wanted,” as some racist idiot is doing in Palm Beach County, Florida, is so far below the the good-neighbor baseline it can’t even be measured. It’s not surprising that the bigot wouldn’t give his name to the news reporters who showed up to his door — just as there is a reason members of the KKK wear hoods. Inveterate racists know their bigotry is deeply shameful, and they are compelled to hide behind a veil of anonymity as a result. What would you do if your neighbor flew a KKK flag and seemed to be recruiting for one of the most vile organizations in American history? I’d be inclined to display a sign of my own: “My Next-Door Neighbor Is A Racist. I Despise Him, And You Should, Too.” And I think I would add that it’s my practice to take photos of everyone who visits him and publish those photos on the internet, too. In Houston, a Texas district court judge has declared that Wilbur, a Vietnamese pot-bellied pig, is a “household pet” who can remain in his owners’ home. The case addressed whether Wilbur violated the local homeowners association rules. Wilbur was a Christmas gift from Alex Sardo to his wife, Missy, and he quickly became a member of the family. 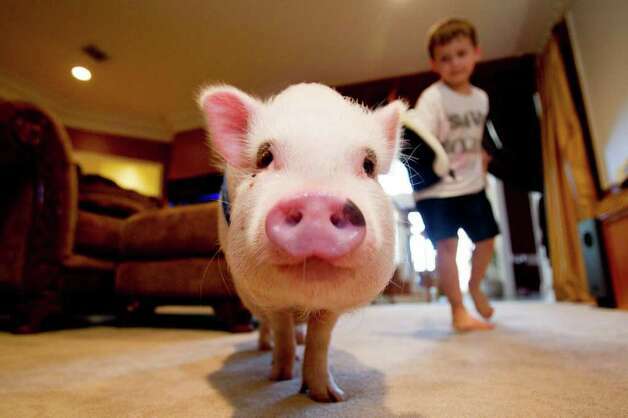 A few months later, a neighbor brought the pig to the attention of “The Thicket at Cypresswood Community Improvement Association,” which concluded that Wilbur was not the kind of “common” and “traditional” pet permitted by association rules and sent the Sardos a letter saying Wilbur had to go. Hear, hear! The ruling is a victory not only for pot-bellied pigs, but also for people who yearn to be free from the nosy intrusions of busybody neighbors who want to control how other people live. This isn’t a case of people raising hogs in their backyard or having a lion for a pet. Wilbur was a well-mannered pig who was kept in the home, didn’t cause trouble, and brought some joy to the lives of the Sardos. 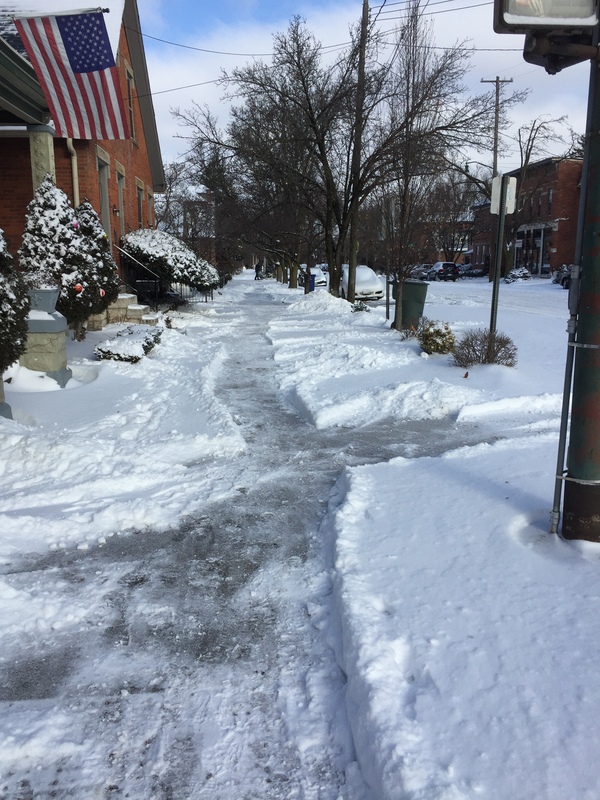 Why should neighbors raise a stink, rather than doing the neighborly thing and keeping their opinions to themselves? If Wilbur’s story causes even one homeowner’s association to back off, he’s served the interests of mankind. Somewhere, a spider named Charlotte and a rat named Templeton are happy that Wilbur was judicially recognized as “some pig” — and no doubt “humble” as well.